There are two ways for your company to pay for Expensify: Pay-per-use Billing, or Annual Subscription. While this article focuses on how your company pays for Expensify, if you're an individual user you can find out more about Expensify's Individual Monthly Subscription in this article. An Annual Subscription doesn’t refer to your billing frequency. Instead, it refers to your active user billing rate, as well as the length of your commitment. The Annual Subscription offers a lower rate ($9 on Control or $5 on Collect) for each user in your company's Subscription Size. On the Pay-per-use Plan, the active user rate is $10 for Collect policies and $18 on Control policies (Billing also available in GBP, AUD and NZD). Policy Billing Owners of Control policies, or a mix of both Collect and Control policies are charged $9 per active user on an Annual Subscription, with additional users charged $18 for actions taken on a Control policy and $10 for actions taken only on a Collect policy. Otherwise, Policy Billing Owners of only Collect policies are charged $5 per active user on an Annual Subscription, with additional activity charged at $10. 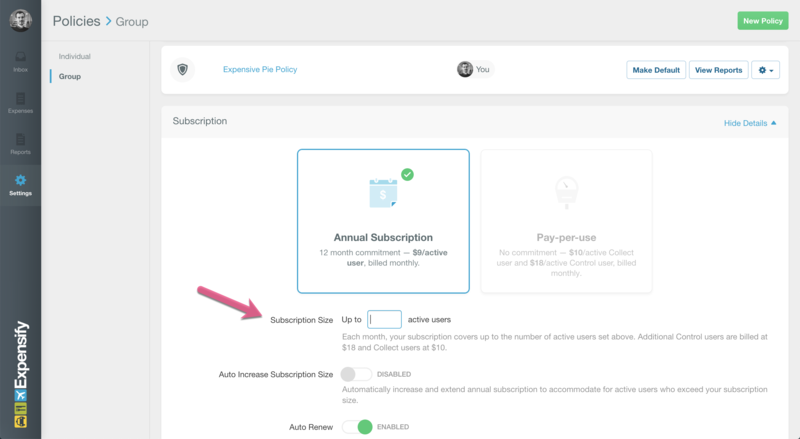 To understand how your Subscription Size affects your billing, let’s assume you have a Control policy with a Subscription Size of 10 users. You’ll be billed $90 for up to 10 active users. Since we don’t bill based on individuals, the activity each month can come from any set of 10 users. If you exceed your Subscription Size of 10 users, the additional users are billed at the $18 Control (or $10 Collect) rate. If you’ve never had activity in Expensify, your Subscription Size is set after your first month. 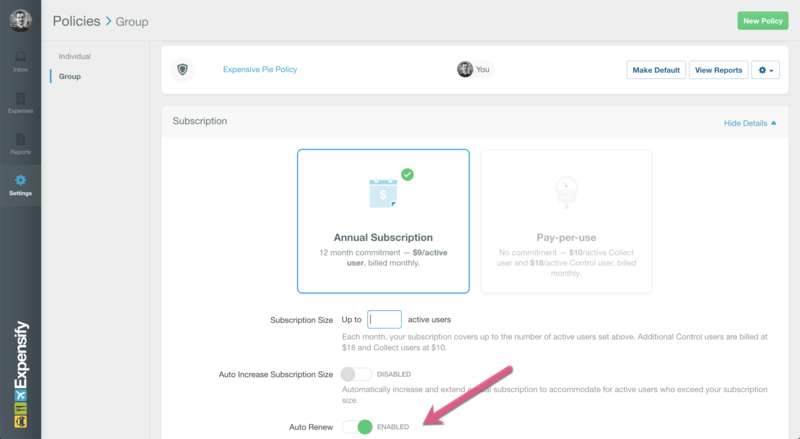 For existing policies switching to a Subscription, the Subscription Size is set to the number of active users on your last month’s billing history. If your original user commitment ends up being too small for the entire year, you can add users to your subscription at any time. Whenever your subscription size in increased, you will start a new 12 month commitment at that new subscription size. You can increase your subscription size manually or automatically. To manually increase the size, just update the number in your Subscription Details. You can also do this automatically by enabling Auto Increase Subscription Size. This feature manages your subscription by automatically increasing the count whenever there is activity that exceeds your Subscription Size. You can remove users from your subscription size at any time, but you may be charged a rate adjustment if it is past your first month’s billing. When you remove users after the first month of billing, you'll be charged the difference between what you have paid to-date on your Annual Subscription and what you would have paid had you been on Pay-per-use Billing. Note: You cannot decrease your Annual Subscription to 0 - instead you will have to Downgrade from an Annual Subscription back to Pay-per-use billing.